Sporting an 18.5 inch HD 16:9 widescreen display, up to NVIDIA® ION™ 256MB graphics processor for high definition video support and an optional single-touch touchscreen panel, the C200 is an affordable and fun family PC with a sleek, compact design. 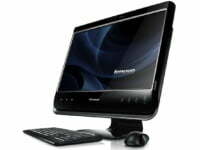 This all-in-one computer, available with up to Intel® Atom™ Dual Core processor D510, and complete with an integrated DVD reader/writer, is the ideal PC for any room in the home. For improved video chat communications, the C200 features integrated stereo speakers and the Lenovo High-Sense Webcam, which boasts a larger lens and finer color and shading sensitivity to create clearer images and greater contrast, especially in low-light environments. “The Lenovo C200 with NVIDIA ION is an ideal way to meet the ‘info-tainment’ needs of today’s digital family. Its snappy graphics and big screen are perfect for accessing the Internet, sharing family photos, playing casual games together or enjoying the latest online videos in high definition,” said David Ragones, director of ION and GeForce product marketing, NVIDIA.